Borrisoleigh Community Development Association (BCDA) would like to invite you to ‘The Big Hello’ on Saturday May 4th at 4pm in the Community Centre. The Big Hello!, Ireland’s National Community Weekend, is going to be a weekend of community celebration. The event is a celebration of the great spirit of community that exists across the country, and is an effort to help people who share communities to come together, get to know each other, and deepen the sense of community in their area. 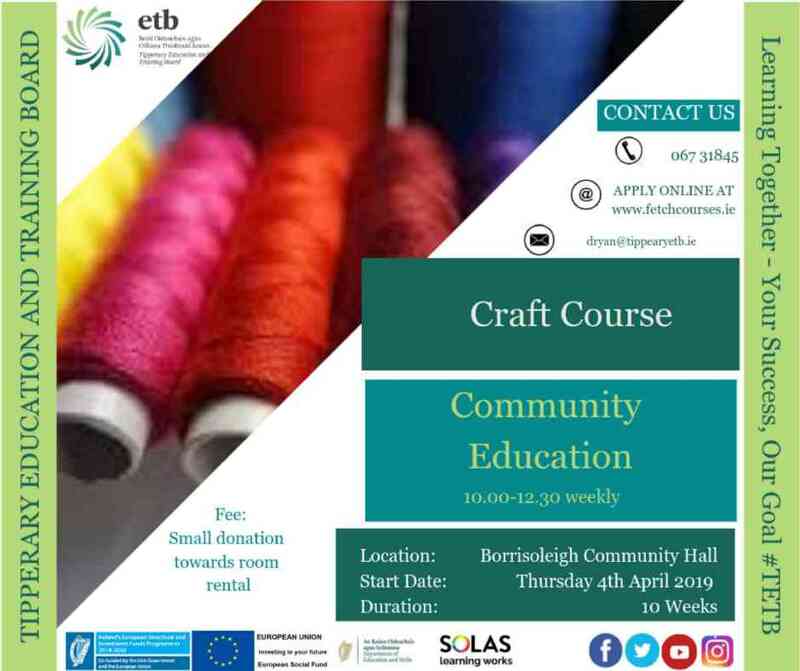 BCDA are hosting this free event in Borrisoleigh and all are welcome to attend. In particular we would like to see representatives from committees and volunteers of the various clubs and organisations in the Parish attend. So much work is done by committee members and volunteers throughout the year who volunteer their time and we would like to reward your efforts with a chance to enjoy some refreshments and meet your friends and neighbours in a relaxed and friendly environment. Keep an eye on this website for further details. 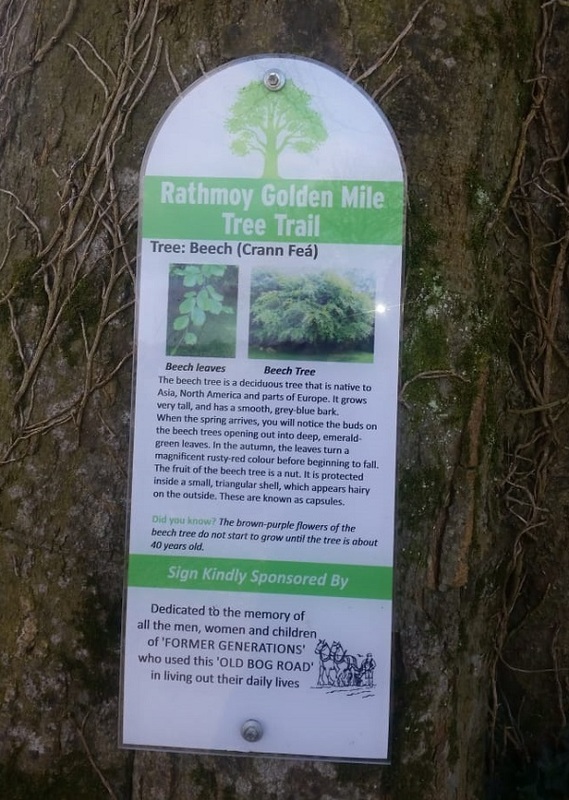 Preceeding the event in the Community Centre, Rathmoy Residents Association in association with BCDA are officially launching the Rathmoy Golden Mile Tree Trail. This event starts at 2pm. In conjunction with CM Signs of Thurles, signs have been erected along the Golden Mile with information and history of trees along the walk. Dr. Aine Lynch of the National Parks and Wildlife Service and Tom Gallagher from Cabragh Wetlands, will be in attendance and will speak a little about the biodiversity of trees etc. as the walkers move along. There will also be a Seanchaí and historian to guide us through some of the very interesting stories of Rathmoy. Tales such as ‘Moll the Shilling’, ‘The White Witch’ and plenty more will entertain and inform all who attend. 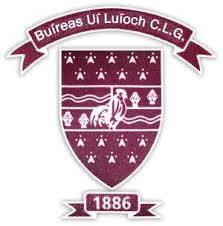 Attendees are asked to park in the Town Park and take the 3 minute walk down towards Rathmoy to take part. At the end of the walk approximately 3.30pm there will be quick quiz to test your knowledge of what you have learned! Afterwards everyone is invited back to join in with ‘The Big Hello’ event in the Community Centre. So put it in your diaries, Saturday 4th May, and make sure to attend ‘The Big Hello’ and join us in celebrating the wonderful community spirit that is alive and well in Borrisoleigh. You can attend either of the events or both, the choice, like the community, is yours! Borrisoleigh Community Development Association will be starting a fun fundraiser in the near future called ‘Split The Pot’. Stay tuned for more details! 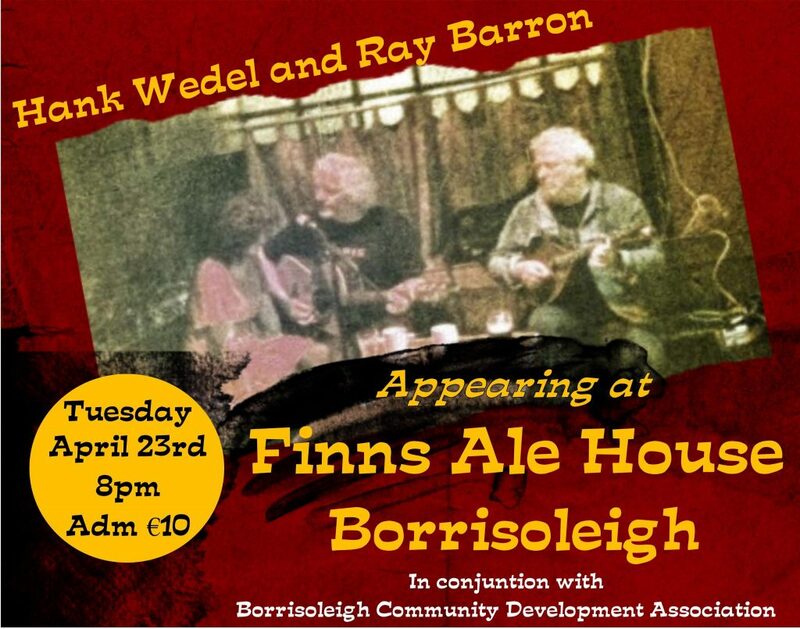 Hank Wedel & Ray Barron will play in concert in Finns Alehouse, in conjunction with Borrisoleigh Community Development Association, on Tuesday April 23rd from 8pm SHARP….. Cost €10. 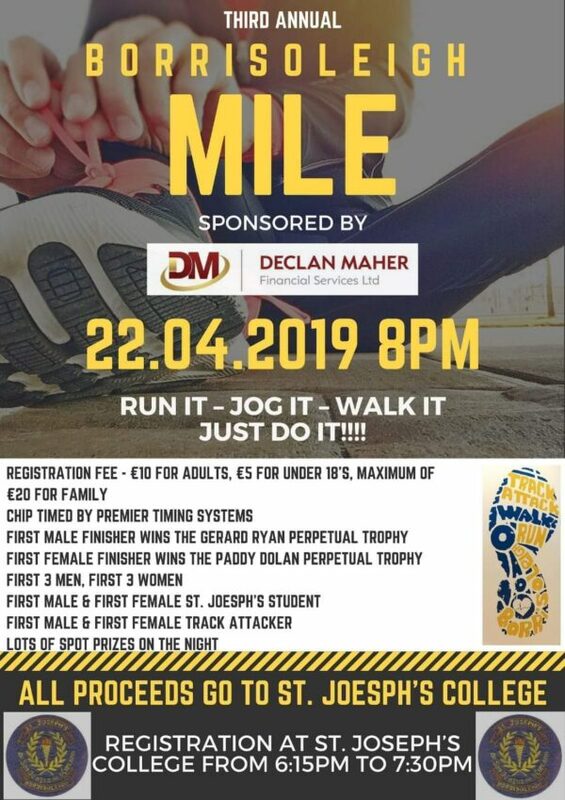 St. Joseph’s College is very proud to be associated with this event for the second time. It was a wonderful success last year and we are looking forward to seeing everyone turn out again on Easter Monday Night. Run it, Jog it, Walk it. So put it in your diaries. We will see you there. St. Joseph’s College Borrisoleigh, ‘Woollen Wonders’. L to R: Ruth Bourke and Anna Stapleton. 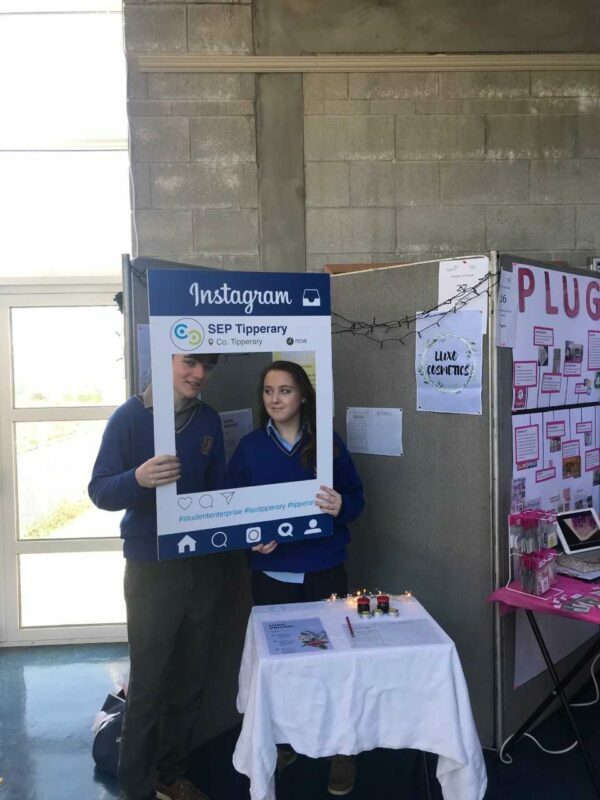 St. Joseph’s College Borrisoleigh, ‘Pop Surprise’. Team: Marie Moroney, Megan Doran, Breda Ryan, Anna Grace, Carlota Munzo Sanchez. St. Joseph’s College Borrisoleigh, ‘The Motivators’. L to R: Taylor Molloy, Maria Hassett and Emily Ryan. 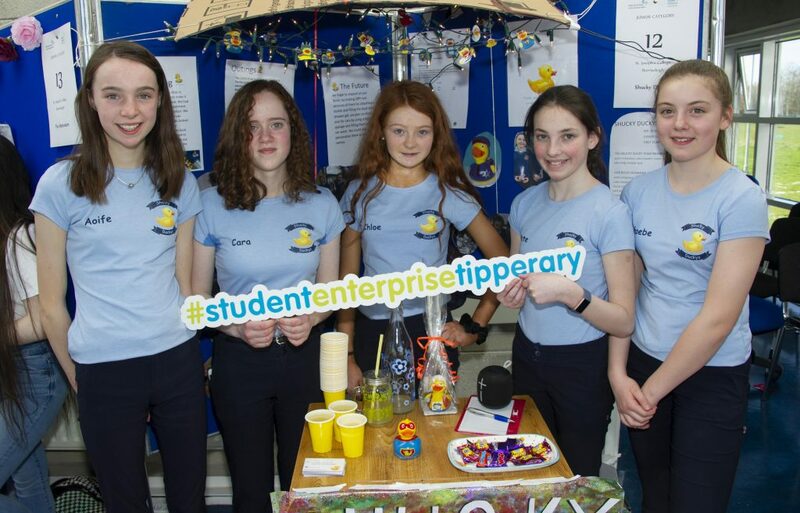 St. Joseph’s College Borrisoleigh who came third in the overall Junior Section with their project ‘Shucky Duckys’. L to R: Aoife Fitzgerald, Cara Fogarty, Chloe Carroll, Kate Ryan and Phobe Sage. On Thursday the 28th of March seven teams of young entrepreneurs left ST. Josephs College for LIT Thurles to partake in the county final of the Tipperary Student Enterprise Program. Three months of hard work was about to pay off as all of the teams had a truly enjoyable day. 95 teams were present across three categories from 22 schools so it was a very busy competition for the day. Our three first year teams competed in the Junior section. The Premier Hooks team of Cathal Fred, Brian Farrell, David Conway and Pa Brett really impressed the judges with their attention to detail on their medal stand. The Motivators, which consisted of Taylor Molloy, Emily Ryan and Maria Hassett really brought a great message of wellbeing to proceeding with their Positive Jar. The Shucky Duckys wont be soon forgotten by anyone who came near their stand on Thursday. 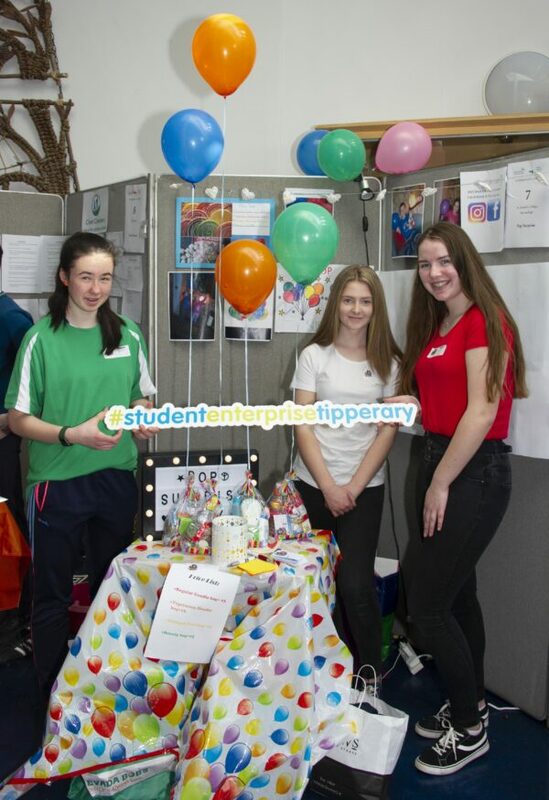 The five students, who were, Kate Ryan, Cara Forgarty, Pheobe Sage, Aoife Fitzgerald and Chloe Carroll were infectious with their enthusiasm and created a very unique product. SO much so that out of 31 teams in the Junior section, they came 3rd! a fantastic achievement. Our three second year teams competed in the Intermediate section. Breda Ryan, Carolta Muniz, Maria Moroney, Anna Grace and Megan Doran made up Pop Surprise. This business really brought fun and laughter to the competition with their fantastically fun product. 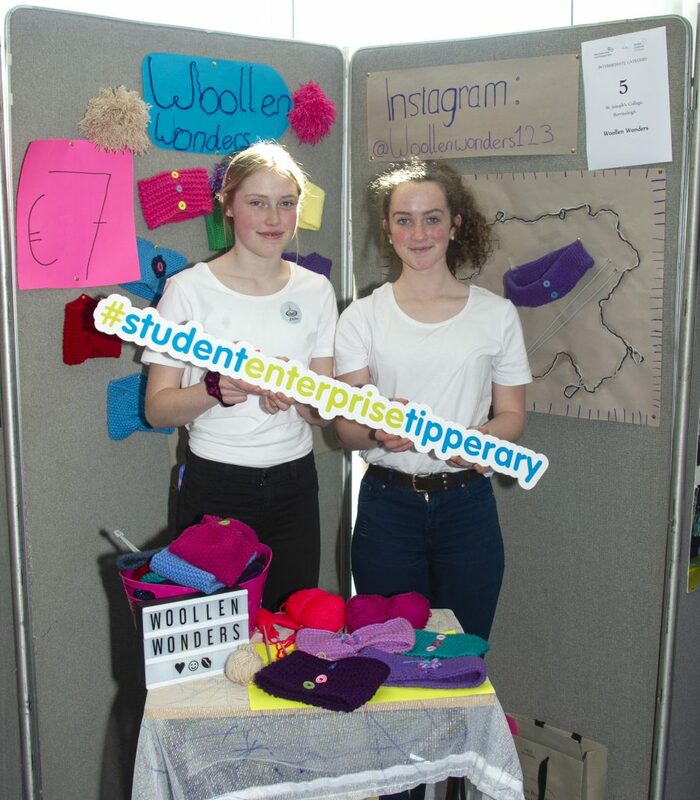 The Woollen Wonders team of Anna Stapleton and Ruth Brouke had a very traditional product but it was their social media presence that really caught the eye. Deemed to be the best out of the 28 teams in their section. ES Reuse really embraced the whole process. 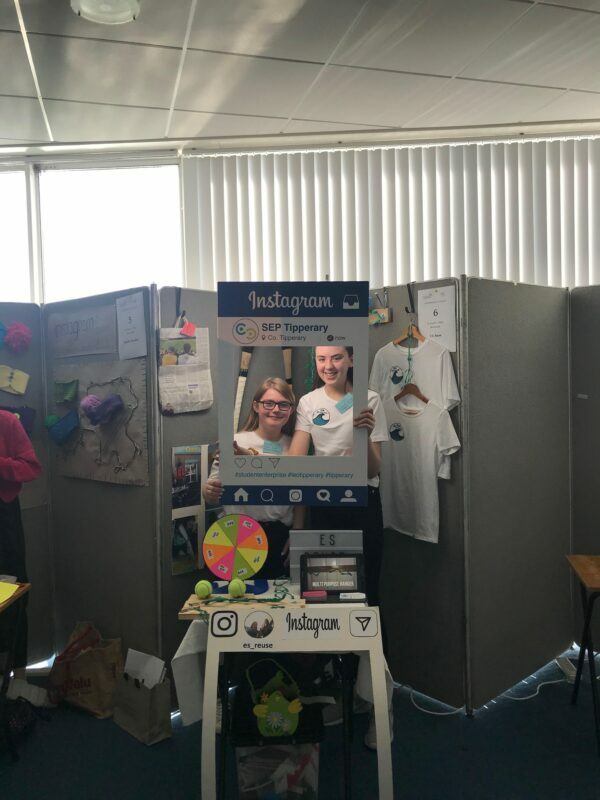 The two members of Sarah Ryan and Emir O’Donnell worked endlessly to develop and improve their product. They were rightly rewarded as out of the 95 teams present, the judges decided that they had focused the most on helping the environment and they won the Up Cycling award. We had one entrant in the Senior section. Luxo Products really wowed the judges when they came to the school in January. 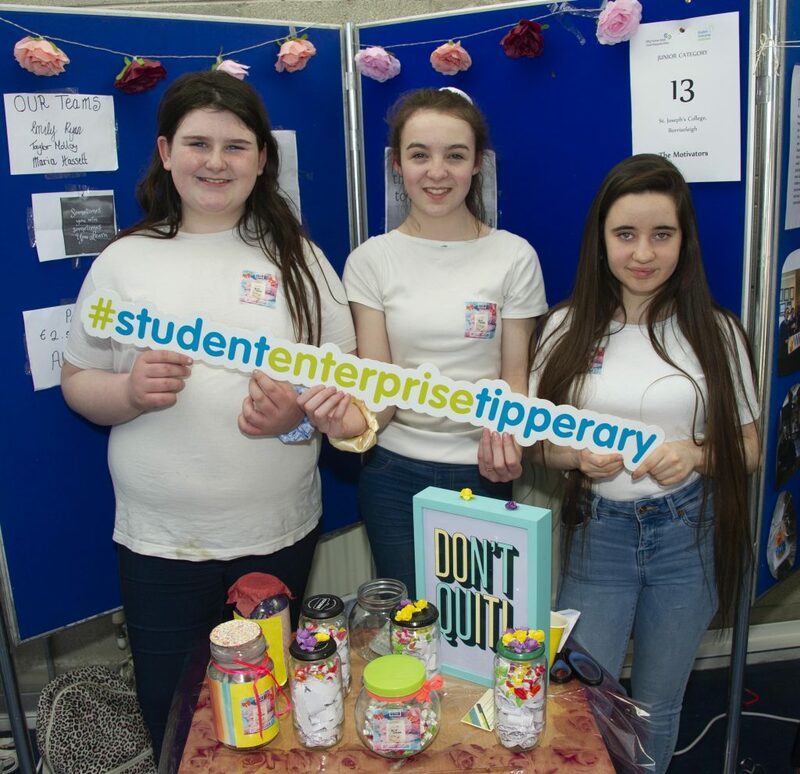 The three members of Rachel O’Connell, Michaela Shanahan and Victoria Novak came up with a very marketable product that has loads of potential. Unfortunately on the day, two members had prior commitments so they were unable to attend but Michaela held the forth brilliantly, assisted by her classmate Simon Humphries for the day. 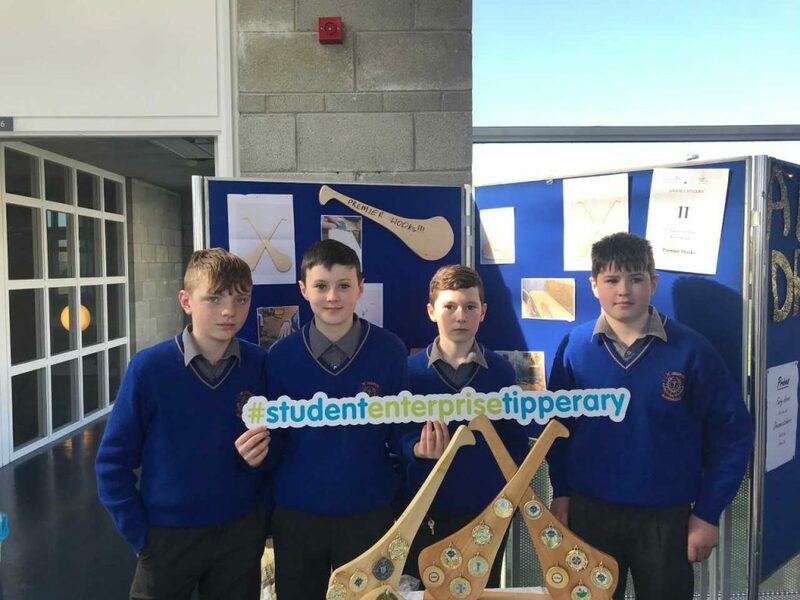 Overall the students really enjoyed the day and their Business teacher Mr. McLoughney complemented them on their work ethic, creativity and their behavior on the day. All of us in St. Josephs College are hoping for more success like this in the coming years. A book on the life of Sean Hogan, of Soloheadbeg and Knocklong fame, will be launched in the Excel in Tipperary Town on 11th April next, at 8.00 pm. This book charts the life of the young volunteer, his exploits during the War of Independence and Civil War and also tells about his life, post-conflict. While recognising the undoubted heroism and courage, this work gives equal prominence to the loss and sacrifice, along with the wider impact on the family. This story can be equally applied to many of the combatants of that troublesome time. 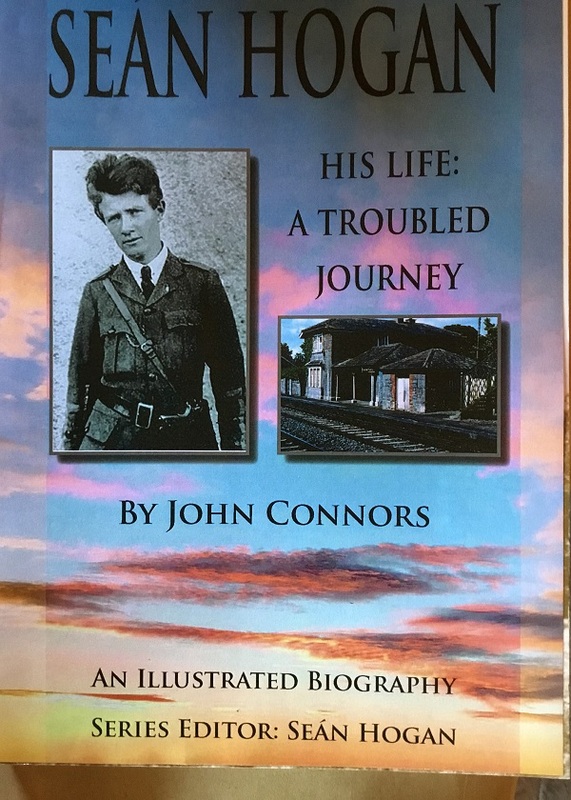 The author, local man, John Connors, along with researching the various records and archives, was given free access to the Hogan family papers and has also conducted interviews with many people who had known him during his years in Athboy, Celbridge and Dublin. The book, containing material not seen previously in the public domain and generously illustrated with some rare photographs, will be launched by, another Seán Hogan, historian and author of the widely acclaimed, “Black and Tans in North Tipperary”. Borrisoleigh Active Social Club held their April meeting recently. The following are some of the events coming up. May 1st we are heading to The Manor Stone and Garden Centre in Ballacolla and there are a few seats available on the bus if anyone is still interested in booking a seat. On June 19th we are heading to the Dáil. We can’t take anymore names for this trip. There has been a change in our arrangements to head to Galway in September. We would be leaving Borrisoleigh on September 15th for 3 nights B&B and evening meals in The Ardilaun Hotel Galway . 2 day trips touring and a night of entertainment in the hotel. Anyone interested in any of the above please contact Lucia 0863961211. Pilates class for our members continues every Tues at 6.45pm in the Community Centre Borrisoleigh. Everybody is welcome. Fr. Martin Murphy PP Drom and Inch is leading a pilgrimage to Poland from 26th May to the 31st May 2019; visiting Krakow, shrine of Divine Mercy, Salt Mines, Wadowice and the home of St John Paul 11, Auschwicz & Birkenau, Czestochowa and Jasna Gora. The cost is: 959 euro and 220 euro for single supplement. There are a few places available. For further details please contact Fr Murphy at 086 3868877 or Bridget O’Dea at 086 6792754. The 2019 Borris-Ileigh GAA Annual Golf Classic will take place this year across the weekend of 3rd and 4th of May in Rathdowney Golf Club. We encourage all from near and far to come along for a Round in what is guaranteed to be a great day out for all with food and refreshments provided for all on the day. Entry for a team of 4 is €140 and sponsorship of a tee box is €50. The Tea Times are open for bookings as of now, so to get your bookings in contact Martin Fahy (087) 2608780 for all of the details. Don’t hesitate to spread the word, we look forward to seeing you all on the 3rd and 4th of May. Knitting group every Wednesday in the Community Centre from 10.00am to 11.30am. For details contact 086 3098982. New members always welcome.